As a business leader, you want employees to be as productive as possible. You already know that stress can lead to poor performance, and that communication is essential to ensuring that they are motivated and employee productivity thrives. But no matter the steps you’re taking to increase employee productivity, it can be tough to know if you are getting it right. Is your new company communications program really improving efficiency? Are your weekly 15-minute standup meetings preventing unnecessary emails down the line? It is tough to know. That’s why it is important to measure employee productivity metrics. There are a few ways you can chart employee productivity to gain an understanding of how your workforce is performing. 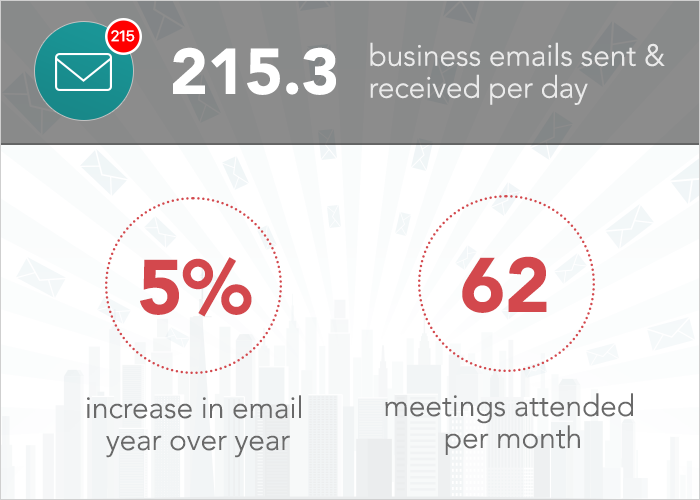 Did you know that 96% of workers say that unnecessary emails waste their time? According to The Center for Creative Leadership, that’s the case. You may believe that emails getting sent within your company are increasing productivity, but how much time are your employees spending sending and replying to emails? According to Radicati’s Email Statistics Report, people sent and received an average of 215.3 business emails per day in 2016, and the amount is expected to grow by 5% year over year. And it’s not just emails either. According to Atlassian, the average employee goes to 62 meetings per month, and believes that 31 hours of those meetings is wasted time. How many company emails did you send yesterday? How many company emails did you receive yesterday? How many meetings did you attend today, last week, this month? On a scale from 1-10, how productive do you find your meetings? Of course, you also need to ask employees whether they find the emails and meetings they attend necessary or unnecessary. As a company leader, you’re constantly introducing new programs and ideas to your team. But are they taking you up on what you’re offering? For example, you might offer training programs. How many employees are taking advantage? Make sure to measure participation over time. If a program was popular when it was first introduced, but now has very few attendants, it may be time to refresh your offerings. Every time an employee leaves your company, other employees have to scramble to cover their workload. Then, substantial time is spent finding a replacement, and then training them to get up to speed. Because of this, high rates of employee churn can severely hurt employee productivity. That’s why leadership teams need to calculate employee churn on a biannual, or annual basis. How many employees left the company this year? What is the average time an employee stays with a company before moving on? How many members of senior leadership resign in a given year? Employee turnover is one of the most valuable metrics for HR departments, and you can calculate turnover rate using a fairly straightforward equation. Are your employees happy at your company? They might say they are when you ask face-to-face, but there are better ways to find out how employees are feeling. For example, it’s worthwhile to send quarterly or annual surveys to employees and let them reply anonymously. You can ask them whether they’d recommend working at a company to a friend, what they think about leadership, and what aspects of the company they like, and don’t like. There are plenty of tools that simplify this process. A favorite is Glint, which allows you to periodically survey employees and get a sense of how they’re feeling about their work and the company overall. You can also use Net Promoter Score (NPS) to assess employee sentiment over time. It seems odd to measure employee helpfulness, but some companies are finding that it’s a valuable way to gage productivity. For example, Joshua Konowe of Konowe & Associates told AllBusiness Experts that he uses levels of helpfulness as a metric of productivity. Here at Dynamic Signal, we prioritize areas like helpfulness through Fond, a platform that makes it easy to recognize and reward employees. We find it brings transparency and allows our team to recognize each other and thank their peers for being helpful. The reason to measure employee productivity is so that you can make changes to improve. By figuring out how much time to spend on various tasks, charting attendance, and measuring employee turnover, you can find ways to create a company where employee productivity is front and center.